One of the enigmas of the Planet X phenomenon is the apparent absence of the appearance of 'Nibiru' over the last few thousand years. The last historical record of Nibiru asserted by Zecharia Sitchin was for 3760BCE. A lot of speculation has filled the void as to when it last appeared. Its projected 3600 year orbit would place it around 160BCE, but the appearance of a Messianic Star during the Graeco-Roman era creates a whole morass of issues. Many have argued for a different timeline where Nibiru appeared during a chronologically adjusted Exodus event. Such a placement around 1600BCE then projects an imminent modern sighting. Alas, no such luck, with 2003 and 2012 passing without incident. Indeed, modern astronomy's observational power precludes a nearby Planet X body at all. If it is out there, it really is very distant right now. 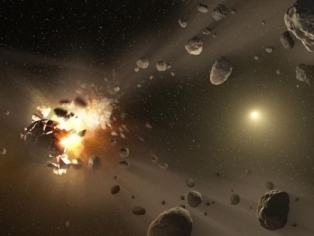 Let's say the Dark Star has its own series of Trojan asteroids lying along its orbital path, similar to those which precede and follow Jupiter. These so-called Trojans occupy stable LaGrangian points along an orbital path. The Dark Star Trojans might then enter the solar system periodically when the Dark Star is some distance out. This additional sighting of what are then essentially Trojan comet swarms as observed from Earth might be an aspect of the 'Nibiru' phenomenon. Consider: if one were to stand stationary upon Jupiter's orbit and watch as the gas giant periodically sweeps past. Well one would first see its Trojans, then the planet, then the following Trojans. Then nothing for a long time before this sequence is repeated. Perhaps then the experience of Nibiru is similar. Comet swarm, Dark Star interference, Comet swarm, then a long, long period of no activity. If the Dark Star orbital period is in the order of tens of thousands of years, then it's possible that the 3600 year interval is that between the Dark Star and its Trojans. This might explain the lack of appearance of Nibiru in modern times; i.e. the Flood event was caused by the first set of DS Trojans 10960BCE, the Dark Star interference was around 7360BCE, the following DS Trojans then created a predicted and historically recorded visible phenomenon in 3760BCE at a point when the brown dwarf was already a long way out and retreating - and nothing since then. This scenario would explain the series of Nibiru events in pre-history, as well as its evident absence since. This week's revelations coming out of 'The Guardian' and 'The Washington Post' are surely no real surprise. Governments spy on us. The Western intelligence network is dominated by a quintet of English-speaking countries which share data. Even though constitutional rights might legally prevent any one country's agencies from spying on their own citizens, such apparent safeguards are circumvented by jurisdiction swapping. GCHQ mines data for NSA, and vice versa. This matters little to British 'subjects' of Her Majesty and her Government, whose privacy has no constitutional basis (we're used to CCTV on every other street corner, which, to be fair, has brought the general incidence of crime down). But it does mean a lot to American citizens hoping for Fourth Amendment protection from surveillance intrusion. When much of the modern architecture of the Internet was planned, Government made sure that it complied with their own security requirements. Through in-built junctions, the agencies have access to internet company routers as well as routers crossing international borders. Tapping these delivery networks is a relatively straightforward affair for agencies equipped to obtain foreign signals intelligence. 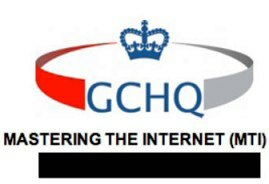 Confirmation of such activities recently has come from the exposure of GCHQ's 'Tempora' programme, with it's SkyBox-style rolling cache of 3 days of Internet traffic, and subsequent availability to hundreds of NSA staff for SigInt filtering ('The Guardian', 23/6/13). Less easy might be dealing with the encrypted data surging through these routers. The big internet companies might have provided the agencies with master keys to decrypt the targeted traffic, although they deny this. But given that the agencies employ some of the best mathematical minds available, and have use of the most powerful computer technology on the planet, it matters not whether the internet corporations aided the data decryption or not. Some argue whether the data accessed is actual content, or simply meta-data. This is an important issue, of course, as content could mean sensitive material like internet banking passwords, and access to personal correspondence and imagery. This is bad enough, but the intrusion into our lives could go still further. Laptops and tablets are equipped with cameras as standard, potentially offering a live video feed from within our living spaces. The new generation of gaming systems may soon offer highly accurate motion-sensing technology that enables those living spaces to be remotely monitored 24/7. Your TV and game console system on standby in the corner of the room thus becomes Big Brother, but this time for real. The genius is that the surveillance equipment is not imposed upon us by a totalitarian state, but is rather welcomed into our homes as the very latest, must-have consumer technology. Given that the 2012 dating also proved inaccurate, I think there's something to the 'Cry Wolf' argument, although I think any conspiracy orchestrated by government agencies seems unlikely. There are enough researchers willing to pin their colours to the mast about an early return of Nibiru, despite all evidence to the contrary, to make intervention seem unnecessary. Mr Hazelwood falls into that category himself. My name is Maurizio, from Italy. I am an independent researcher in our real history. I really appreciate your wonderful studies concerning the Dark Star and Nibiry theory in your main book, but I also appreciated your two novels. I understand that you have planned a third and final one, is it right ? I understand that you are probably the only person, may be apart G.I. Gurdjieff in his " Belzebub's tales " and of course Z. Sitchin, who described in a certain details the activities, the character and the mood of our Fathers or Superior Beings. Therefore, Father Ea/Enki, as the old representative of the opposite Group, the so-called SNAKE GROUP should have not been identified with the Eagle Group, unless you have special meaning for that. Moreover I wonder why you did not mention, Father's Enlil son, Ninurta, as the very representative of the Eagle symbol, from his ancient Lagash cult-town. As far as the eagles go, that just happened to be the dress uniform of the colonel. I have no idea why I chose the rank of colonel for Ea/Enki, but perhaps I was tuning into some truth hidden away that you may have more knowledge of than me. Looking through your presentation, I recognise the symbolism you have indicated, and my desire to highlight a hidden New World Order which is structured around the Anunnaki gods left on our world also taps into those ideas. G.I. Gurdjieff had a very important part in this organization, so that there very clear connection among the disclosures carried out by the same Gurdjieff and Sitchin as stated by Mistlberger. Probably Sitchin was also part of the same organization. Are you meaning that these coordinates are the very coordinates of the real Dark Star ? In fact, as you know, it is a Red Star in the Eagle constellation. 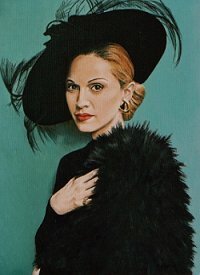 I came across your website whist researching portrait art, and firstly wanted to say how inspired I am by your work. I am an a mature artist, painting when I can, with a particular interest in famous faces, which is how I found yourself. I wandered if I could be cheeky and ask you a question about copyright surrounding painting from other peoples photos. Although I am far from being in a position of selling any paintings, I am keen to learn more about the legalities surrounding painting photos-particularly of recognisable people, should I one day be in a position to be able to sell or exhibit. My style of painting is realistic enough to recognise the photo in which I have referenced, and wandered what your process is for painting from photos not taken by yourself. I noticed on your website you have referenced Mario Testino a few times - did you have to contact him directly before painting any of his photos, or simply accredit him in the details of the painting? It is a good question, and I think it's not an easy one to answer. First of all, I try to gain permission where I can to work from photos, and certainly with social networking that has become a lot easier to accomplish (I use Model Mayhem as a conduit to models and photographers alike). But that becomes a lot more difficult with celebrities and famous photographers like Mario Testino, as they aren't as approachable. However, their work is already in the public domain, and celebrities are also, by definition, publicity-savvy individuals. Creating artwork of favourite celebrities is commonplace, and as far as I can see, goes largely unchallenged. That said, such artwork does not usually earn the artist much, if any money. And I think that's why it's tolerated. Should an artist make a lot of money from their artwork of celebrities without their permission, then I can imagine that the celebrities, and their agents, would have something to say about it, and quite rightly so. The law would be on their side. I don't commercially exploit my work of celebrities in this way. Where I offer prints of my work, or offer digital 'tubes', I avoid using my celeb artwork. My originals are sold privately for what is, frankly, very little money in the great scheme of things - really it barely covers the expenses of being an artist. In other words, by being a poor artist, I don't upset anybody. My Mario Testino pieces of Diana were created specifically for one chap I knew who collected them; who has since died, bless him. And my painting of Madonna, based on the same photographer's work, belonged to the singer herself for a while, before she left England and left it behind in the village she had lived near to. The person who then came into its possession wrote to me sometime after. No money ever exchanged hands as far as I can tell, and Madonna certainly never tracked me down with her lawyers! Some years ago, the publisher of a book of portraits of Madonna wanted the painting included, but I refused for the very reasons we're discussing. I cannot advise you on how to proceed, except to say that as long as you don't financially exploit your talent at someone else's expense, I don't think there's any harm in it. That's common sense, rather than a strictly legalistic answer. But getting permission if you can is always the best policy, either way. "In the last few years a new class of faint stars has been discovered. They are called L-Type Brown Dwarfs because the element lithium appears in their spectra. 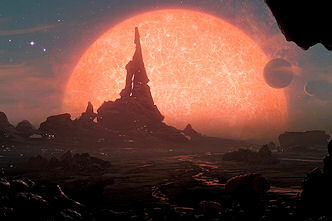 They are the most numerous stellar objects in the galaxy and bridge the gap between stars and Jupiter-sized planets. They are too small to be shining from internal thermonuclear power. A further puzzle is that they radiate blue and ultraviolet light even though they are cool at a temperature around 950K. Water molecules dominate their spectra." I'm no expert on the Electric Universe model, although many folk have sent me information about it before, and we discuss it on the Dark Star Planet X Google discussion board on occasion too. My current stance is that the brown dwarf in our solar system concept can, just about, sit within established physics. Given its outlandish claim already within that framework, I haven't tried to take things further by incorporating the Electric Universe ideas into my work. But, I also recognise that the E.U. framework would allow for the solar system BD to be a more realistic possibility. So I'm open to that as the science develops.